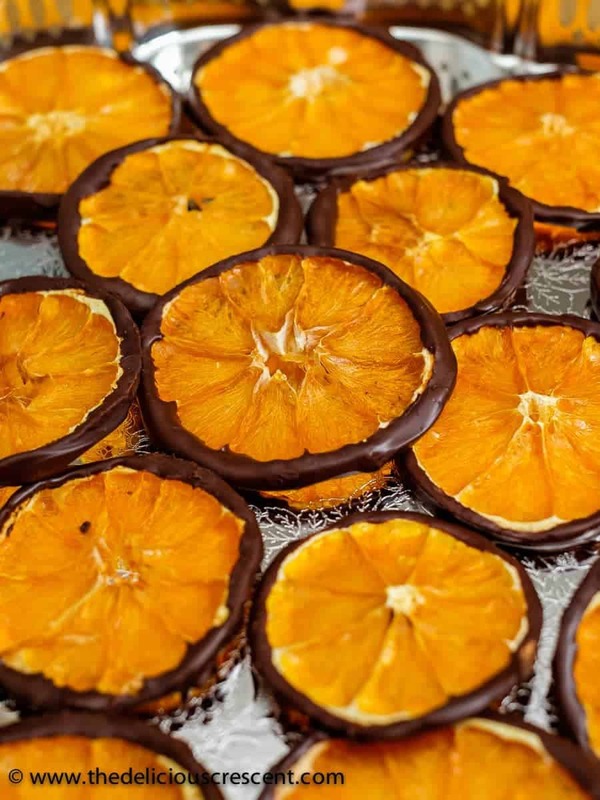 Dark Chocolate Orange Slice Wheels are an elegant treat with decadence in every bite. So easy, healthy and a delicious tangy-sweet treat! 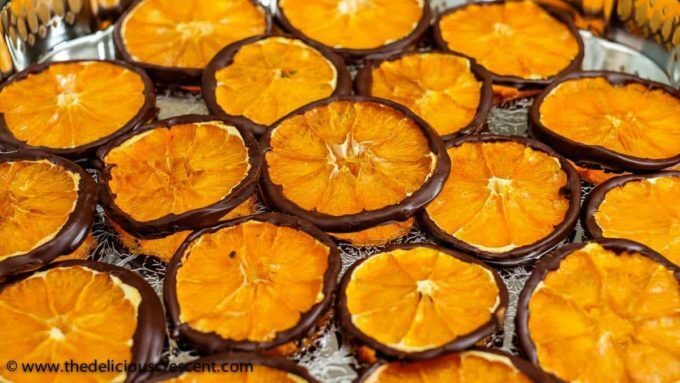 Thick dried slices of orange dipped in luscious melted dark chocolate is a perfect luxurious healthy snack. Which reminds me of another mouth watering buttery orange chocolate cake you may also want to sink your teeth in right now. Lately, I have been obsessed with my food dehydrator – regularly drying up all sorts of things. Look forward to some interesting recipes to be posted here. 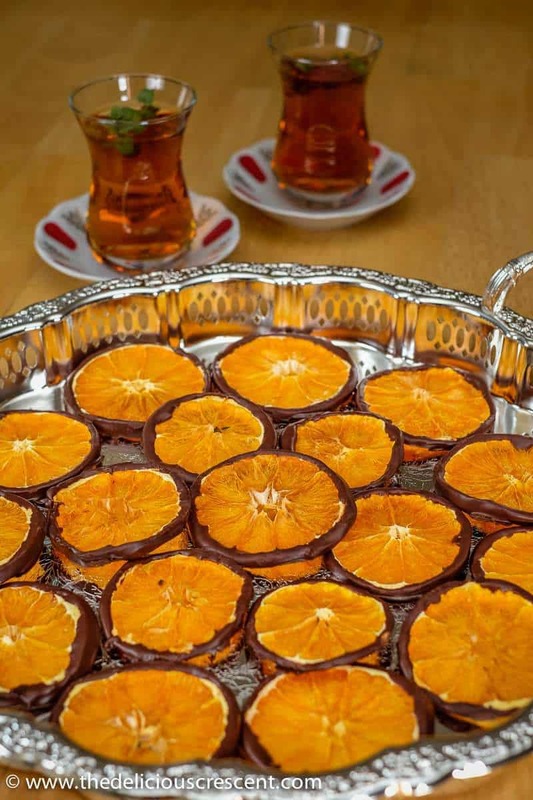 WHAT IS GOOD ABOUT THESE CHOCOLATE ORANGE SLICE WHEELS? The good thing about using these dried orange slices is that it has the natural sweetness, flavor and colors. The process of dehydrating the orange slices, results in a dry, leathery and sweet fruit center. The finished chocolate orange slice wheels have minimal added sugar. Then the natural flavor in the orange rind, which we often use to make baked goodies. And what can I say about the natural colors? I will let the pictures speak about that! Now, you have heard this a lot – Chocolate is good for you! But not all of it though. Before we go into the good things, let’s not forget that chocolate comes with sugar, high calories and fat. So it is wise to enjoy it in moderation. Especially, the dark chocolate is the better option here, since it has more cocoa and less sugar. Cocoa, which is used to make chocolate, is known to have biologically active phenolic compounds with antioxidant potential. Studies have shown an association of chocolate consumption with lowering of cholesterol; improved memory through better blood flow to the brain; lower risk of heart disease and stroke. Furthermore, a research study with dark chocolate has indicated improved performance in fitness training. One interesting thing about chocolate is that – most good quality chocolate is made with cocoa butter, which is made up of oleic acid (a heart healthy fat), palmitic acid and stearic acid. The latter two are saturated fatty acids. However, research has revealed that stearic acid has neutral affects on cholesterol. Although palmitic acid does have an effect on cholesterol levels, it makes up only a third of the fat in good quality chocolate. Wait a minute, that still does not mean that we can eat a lot of chocolate. It only means to say that it is one of those preferred “treats” for you! WHAT IN THE WORLD IS IN THE ORANGE PEEL? Dried orange peels have been traditionally used to treat intestinal inflammation and a variety of intestinal disorders. Several research studies with the hydroxylated polymethoxyflavones found in the orange peel, have exhibited anti-antioxidant, anti-cancer, anti-atherosclerotic and anti-inflammatory activities. Yet another study using a mouse model with the compounds in orange peel also showed inhibition of fat accumulation. Interestingly, a research study with orange peel extract found it to be effective against dental caries pathogens. I hope that I got you into the mood of using yummy chocolate effectively, to satisfy the taste buds. These two-ingredient “Dark Chocolate Orange Slice Wheels” will last well for about two weeks in an airtight container. But the chocolate coating on the rind may lose some of its smooth appearance thereafter, with no loss in taste. In addition, if you are a chocolate cooking fan like me, then you may like these chocolate hazelnut rolls, avocado chocolate truffles and walnut hot cocoa. Enjoy the chocolate ride! If you do not have a dehydrator, you may use this oven method. However, I have not tried it myself. Scrub the surface of the oranges with a vegetable brush and rinse well. Wipe the surface dry using a paper towel. Slice the orange crosswise using a mandolin slicer or a sharp knife. And cut it into uniform 1/4-inch thick slices. Discard the end slices. Next, place the orange slices on the trays of the food dehydrator. Stack the trays into the dehydrator and turn it on. Then let the orange slices dehydrate until the peel is hard and the fruit center is dry. This can take up to six to eight hours depending on the number of trays stacked. Also, remember to switch the order of the trays to allow uniform drying of the slices. Melt the dark chocolate chips in a microwave safe bowl for about one minute, at low to medium setting. And stir it every 15 to 20 seconds until melted. Next dip the orange slices along the rind side and roll it in the melted chocolate. 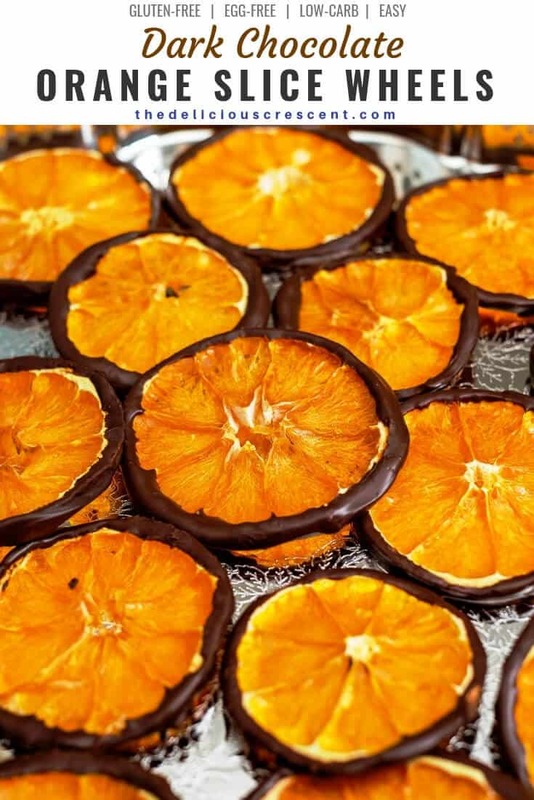 Lay the dark chocolate dipped orange slices on a parchment lined tray and let the chocolate harden. Then eat them before they disappear :) enjoy! The Dark Chocolate Orange Slice Wheels will be optimum in quality for about 2 weeks. Beyond that, the chocolate may lose some shine, but with no difference in taste. Alternatively if you do not have a dehydrator, you may use this oven method. But I have not tried it yet. The amount of chocolate chips needed may vary with the size of oranges and thickness of coating. However, the quantity of the ingredients is a guide. Also, make sure to not melt the chocolate chips at a high temperature. What a great way to get some fruit and that chocolate fix at the same time! Looks so delicous! Thanks Denise. Yes, really. And the intense orange flavor with the concentrated sweetness of oranges was so good. Love this idea!! These look amazing!